Nearly eighty masterpieces of Italian Renaissance drawing from Florence’s Uffizi Gallery, including a number of rarely seen works, were on view only at The Morgan Library & Museum from January 25 through April 20, 2008. Michelangelo, Vasari, and Their Contemporaries: Drawings from the Uffizi surveyed the work of renowned masters who defined Florentine draftsmanship. The exhibition focused on works by important artists who participated in a major campaign of redecorating the famed Palazzo Vecchio, one of the most impressive buildings in Renaissance Florence and the focal point of artistic activity throughout the sixteenth century. Under the auspices of Cosimo I de’ Medici, Grand Duke of Tuscany, (1519–74), this former city hall was transformed by the leading artists of the time into a palatial residence and an icon of Medici Florence. The artist-historian Giorgio Vasari (1511–1574) acted as the mastermind and creative director of the complex and varied decorations for the palazzo, choosing as his collaborators the most talented painters in Florence. The exhibition demonstrates how drawing functioned not only as a means of planning the elaborate paintings, frescoes, and tapestries needed for the refurbishment of the palazzo, but also as a tool that facilitated the creative process for Vasari and his contemporaries. Pontormo, Two Studies of Male Figures ; (1521). Black chalk and red chalk, red wash, heightened with white chalk. Gabinetto Disegni e Stampe degli Uffizi. Palazzo Vecchio was built as the government headquarters of Florence during the thirteenth and fourteenth centuries. After Duke Cosimo I came to power in 1537 through a series of tense political machinations, the young ruler soon established his authority and significantly expanded Florentine territories and influence. A strong personality with a clear vision for his dukedom, Cosimo I moved his family from the traditional Medici residence to Palazzo Vecchio as a calculated gesture to confirm his identification with the state. Cosimo I employed the arts as a means of demonstrating his absolute power. His decision to completely renovate and expand the palazzo was designed to exalt his status as sovereign against an extraordinarily prestigious backdrop. Historically, only the most respected artists and intellectuals had been involved with the palazzo’s alterations, and Cosimo’s campaign was no exception. Florence’s leading painters, sculptors, and architects were called upon to demonstrate their talents in the redecoration of the city’s historical and symbolic center, simultaneously glorifying their ruler as well as their own artistic endeavors. The exhibition was divided into three sections highlighting the artists who shaped the nature of Italian Renaissance drawing and contributed to the palazzo’s decorations under Duke Cosimo I.
one of the so-called Divine Heads, exerted a tremendous influence on Florentine draftsmanship, and his sheet with studies of legs exemplifies his perfect anatomical constructions. Salviati’s great graphic masterpiece, a tapestry design of The Age of Gold. The second section of the exhibition, “Vasari and His Collaborators,” focused on Vasari’s own drawings as well as those of his collaborators in the various rooms of the palazzo, in particular the magnificent Salone dei Cinquecento (Hall of the Five Hundred). Under Vasari’s direction, artists such as Alessandro Allori (1535–1607), Bernardo Buontalenti (1513–1608), Giovanni Stradanus (1523–1605), Santi di Tito (1536–1603), and Giovan Battista Naldini (1537–1591) collaborated on expansive painted scenes commemorating the duke’s military exploits as well as the Medici’s illustrious ancestors. Among Vasari’s drawings on view was an exceptional compositional study of The Siege of Milan for the Room of Leo X and a design for the Salone dei Cinquecento. The final portion of the exhibition, “The Painters of the Studiolo,” showcased drawings by painters of the celebrated Studiolo of Francesco I de’ Medici, Cosimo’s heir. Included were studies by late mannerist artists such as Girolamo Macchietti (1535–1592), Maso da San Friano (1531–1571) and Poppi (1544–1597). I am amazed by the complicated flickering composition of Rosso Fiorentino's "Virgin and Child with SS. John the Baptist, Margaret, and Sebastian and an Elderly Male Saint (Joseph?)" from 1522-5, in black chalk and gray wash.
every arched muscle illuminated--the shadows creating an impossible stone texture. "Punishment of Titius", done by Poppi (a Michelangelo copy) in which the agitated bird flies down in feathered strokes on the softly moulded writhing figure, which may very well be as delicate and beautiful as the Michelangelo original. It goes without saying that the drawings on view are not simply life drawings, or copies of other works. 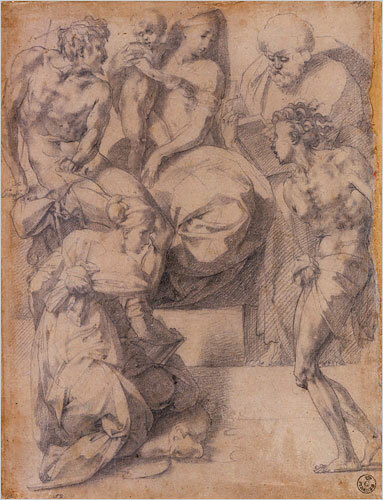 In this show drawing from life meets that special, master Mannerist edge. As Holland Cotter said in the New York Times, "everyone wanted to make art this good and this strange". 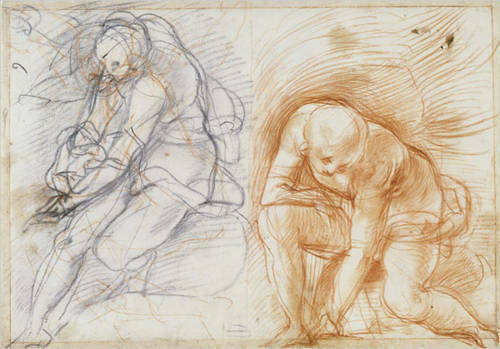 Michelangelo's bizarrely polished masculine figures and limbs sit across from a quick sketch by Pontormo, "Two Studies of Male Figures" from 1521, in which the males in question look like crash-test dummies, twisting and turning in heavy charcoal strokes, emerging from the chaos of the page. An important figure in the transition between mannerism and the baroque period at the end of the sixteenth century, Santi di Tito emphasized in his works a narrative clarity and simplicity of expression. This preparatory drawing is for a fresco in a chapel dedicated to St. Luke, the patron saint of the arts, in the church of Santissima Annunziata in Florence. Intended as an allegorical representation of architecture, its subject employs the story of Solomon directing the building of the temple, presented in a straightforward composition that directs the viewer’s eye to the main figures elegantly highlighted in brilliant white. Known as the first chronicler of the lives of Renaissance artists, Vasari had a prominent career as artist to both the Medici court in Florence and the papal court in Rome. This drawing comes from one of the most important commissions of Vasari’s career: Pope Julius III hired him to oversee the design and construction of his family’s funerary chapel in Rome, a project supervised by Michelangelo. Probably a study for the figure of John the Evangelist, this drawing displays Vasari’s exceptional ability to conjure a figure in his mind and transfer it flawlessly to paper. Trained by Bronzino and deeply familiar with Michelangelo’s sculpture, Allori was often commissioned to supply designs for the ducal tapestry workshop. This detailed representation of a crowd paying homage to Bacchus is the only preparatory drawing that survives from a series intended as models for tapestries with scenes from Bacchus’s life. Finely executed in a wide variety of techniques, this is a typical example of the increasing interest in exuberant decoration that characterized Florentine draftsmanship of the later sixteenth century. More images and comments here and here. The exhibition was organized by special arrangement with the Soprintendenza Speciale per il Polo Museale fiorentino and the Gabinetto Disegni e Stampe degli Uffizi and was conceived by Annamaria Petrioli Tofani, former director of the Uffizi. It will only be shown in New York and is curated by Rhoda Eitel-Porter, Charles W. Engelhard Curator and department head of Drawings and Prints, The Morgan Library & Museum. 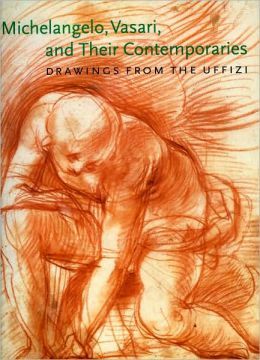 Michelangelo, Vasari, and Their Contemporaries: Drawings from the Uffizi was accompanied by a catalogue written by Annamaria Petrioli Tofani with contributions by Rhoda Eitel-Porter. Inscribed at lower left, in pen and brown ink, Tommaso. Inscribed at lower left, in pen and brown ink, Tomso Manzuoli. Bibliography: Petrioli Tofani 2002, p. 34.